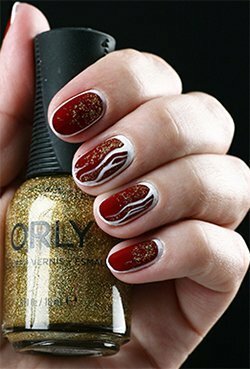 Nail-design "Wine" is made on ORLY preparations and using tools ORLY. Preliminarily perform the procedure of the preparative manicure with the help of special means. In the line ORLY there is a special Cutique, which softly affects the cuticle area being treated, contributing to the careful removal of dry skin and significantly changing the appearance of the hands. The composition of the product includes sesame oil, which penetrates deeply into the skin, softens it, moisturizes and has antibacterial effect. For the perfect manicure, it is enough to apply the Cutique preparation from ORLY on the skin around the nail for 30-60 seconds, and then remove it from the fingers with an orange stick. 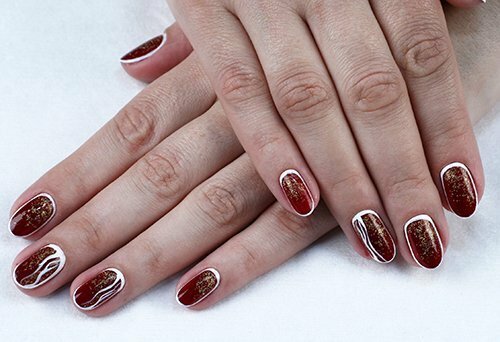 Master class nail-design for the autumn "Wine"
Step 1. Form the nails using the Black Board from ORLY. Treat the hands and all ten nails with the Clean Prep disinfectant from ORLY. Step 2. 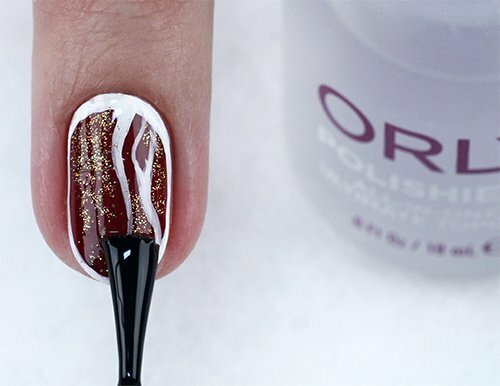 Apply the Bonder base coat from ORLY. 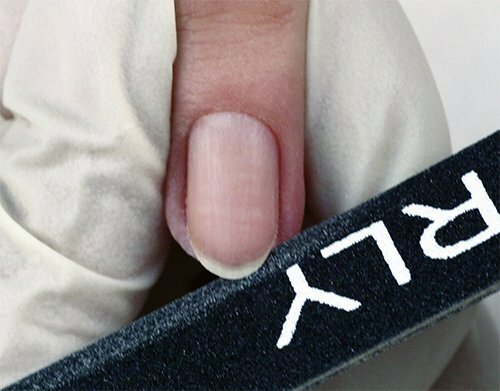 This will ensure better adhesion of the lacquer coating to the nail plate, ensuring a lifetime of design. Step 3. 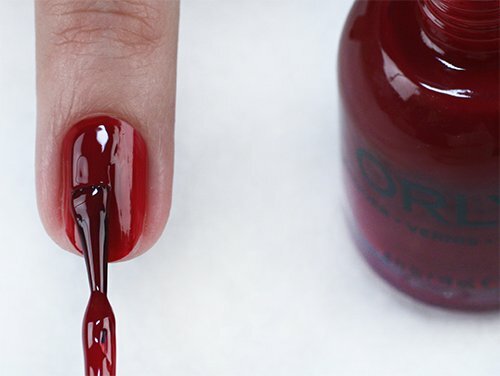 As the main coating for nails use a varnish of wine shade Scandal (861) from ORLY. For a more saturated color, apply it in two layers. Step 4. 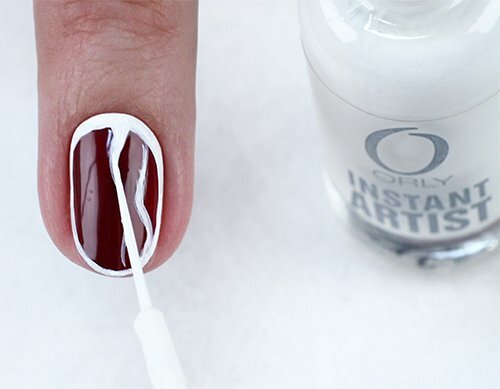 White Crisp White shade (40721) from the Instant Artist collection from ORLY and draw a border of each nail from the bottle. Step 5. With the same paint draw the details of the art - smooth lines from the hole to the free edge of the nail. Step 6. 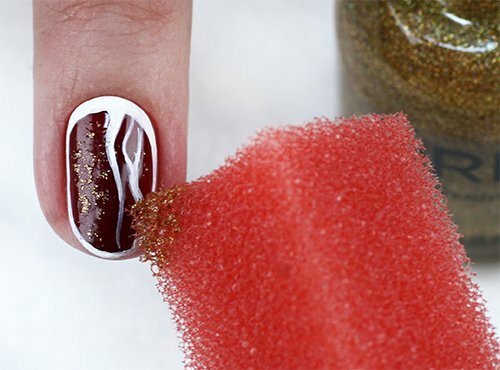 Using a dry sponge and nail polish Bling (20829) from the collection of Sparkle from ORLY, add shine to the nail design. Step 7. 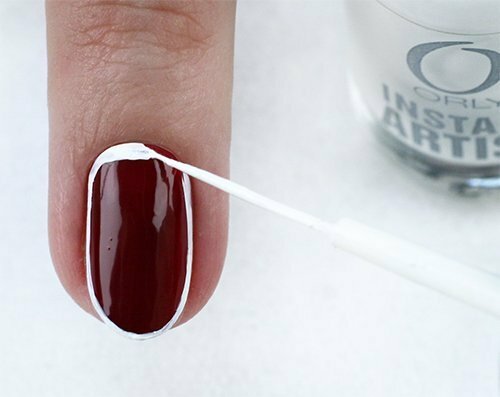 Fix the pattern on all nails with the Polishield top coating from ORLY. Finished kind of nail-design "Wine"